Consider God’s design for the Body of Christ to function interdependently. We need each other. If we don’t purposefully work to coordinate ministries and programs in the church with one another, we can find ourselves rather splintered, isolated, one part doing their thing and the other doing their thing. When that happens, the Body as a whole doesn’t tend to see as much organic growth. 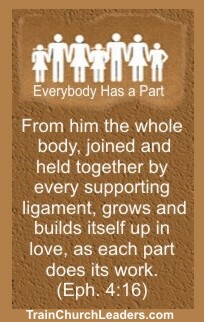 God designed the Body for each part to work in a coordinated fashion that leads to the growth and health of the whole. 1) We are spiritually gifted for the common good. 2) We are to equip people for ministry that grows the Body. 3) There is only one Head of the Body. Jesus, as the Head of the Body, gels us together. The Spirit gifts people within the Body so when all working together, we can accomplish His purposes for the Church. With people equipped and doing their parts, God brings growth. The Church isn’t designed to be about individuals but rather the whole group. Even the terminology used for the Church suggests the need for coordination to function that way — Body (1 Cor. 12:12), family (Eph. 3:15), household (Eph. 2:19). Group to meet needs and fellowship around shared interests but guard against becoming so isolated in these groupings that they become cliquish and/or independent from the others. You can help prevent island mentalities, promoting interdependence instead, through the development of platforms for sharing of information, resources, praises, and prayer requests with each other. This entry was posted in Coordination .